One of the few powers remaining to back Bench Councillors such as myself under the elected Mayor and Cabinet system is the opportunity to ask Questions at Full Council Meetings to Members of the Executive and Chairs of Committees and Forums. These of course need to be submitted in writing in advance of the meeting. Very few Councillors actually take the opportunity to ask questions and the last time I did so the Mayor was very sarcastic and snide during his answers. However, I still think it is important to ask questions and so have put down two for the next Council Meeting obnn13th September. I'll let you know how I get on. 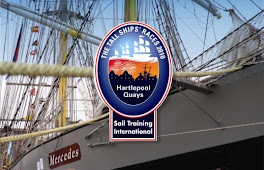 Hartlepool understands that a significant budget will be required to cover the costs of the visit by the Tall Ships' Race. However, nowhere in the information made available to me is their any indication of what a "significant budget" would actually be. Could you inform this council of the total level of council spending anticipated over the period up to and during the race and the budgeted breakdown spend in each key area e.g. How much is anticipated for personnel costs, construction costs, administration, hospitality for Crews, marketing, insurances, etc. MP’s have recently criticised fortnightly bin collections as inappropriate for urban areas and that there was no proof it increased recycling. Hartlepool Council however is pressing ahead with fortnightly bin collections and to the dismay of some residents these are soon to be introduced to St.Hilda Ward. Does the Mayor have any hard, quantitative evidence that he can bring to this council that shows fortnightly bin collections have resulted in an increase in recycling in Hartlepool?